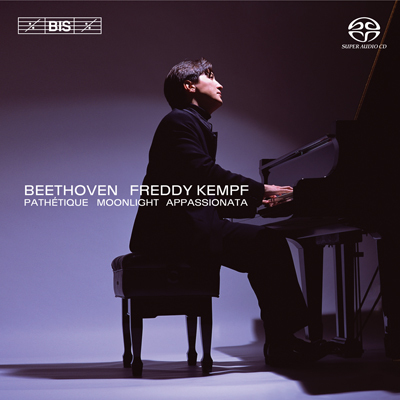 The first disc we released with Freddy Kempf playing Beethoven (BIS-CD-1120) was welcomed with great acclaim all over the world. English reviewers called his interpretations "fresh, vibrant readings presented in a fluent eagerly communicative style‚ (Gramophone) and judged that "Kempf's insight into the character of each of these Olympian masterpieces is astonishing and is allied to formidable virtuosity and musicianship" (Sunday Telegraph). Of course the great thing about Beethoven, as with all great music, is that there are no definitive performances. A performance by a musician with the skills, charisma and musical insights of a Freddy Kempf naturally awakens our appetites. Not because they will, perhaps, tell us more about Beethoven or more about Freddy Kempf, but because, if we are lucky, they will communicate insights into life itself; insights that words cannot convey, that paintings cannot depict, that moving images cannot even approach. Music, in the best instance, communicates at a level that other arts cannot reach. So the best compositions, interpreted by contemporary musicians of the highest calibre, are naturally a mouth-watering prospect. Like this new disc!